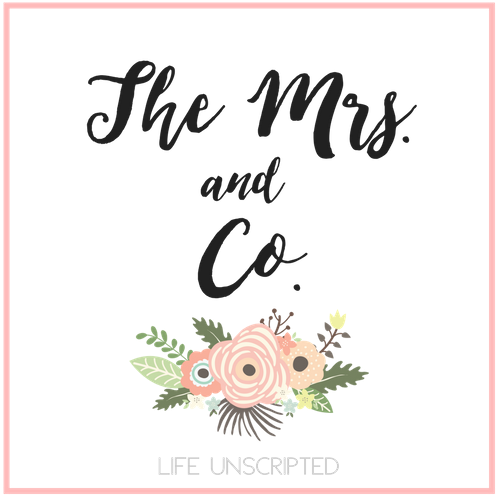 Landon's Nursery Reveal - The Mrs. & Co. When I found out I was pregnant with Landon it took me some time to really accept that this baby was actually happening. 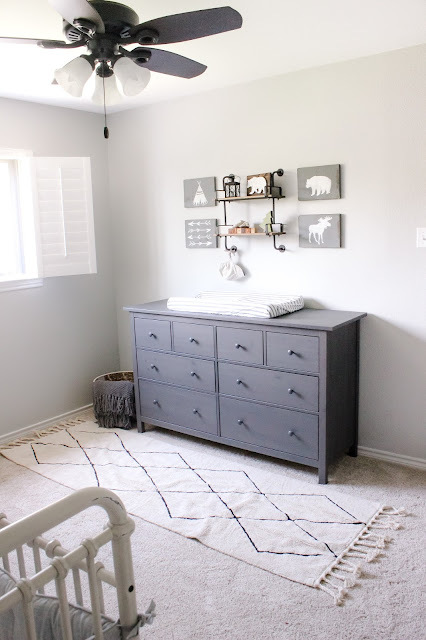 I was too scared to even think about how I'd decorate his nursery at the beginning. So the decorating part didn't really start until my 3rd trimester. Even then I didn't have a solid "theme" that I wanted to go with. So one day after dropping Raegan off at school Hudson and I headed to Hobby Lobby. The Mecca of decor ideas. I thought for sure I could find a theme while walking around. Well of course, like any 1 year old, Hudson wasn't interested. So I literally started just throwing things into my cart that I liked and prayed that once I got home it would all go together in some way. After getting the babies down for the night I pulled out all my treasures, laid them out, and the theme of Landon's room was born. 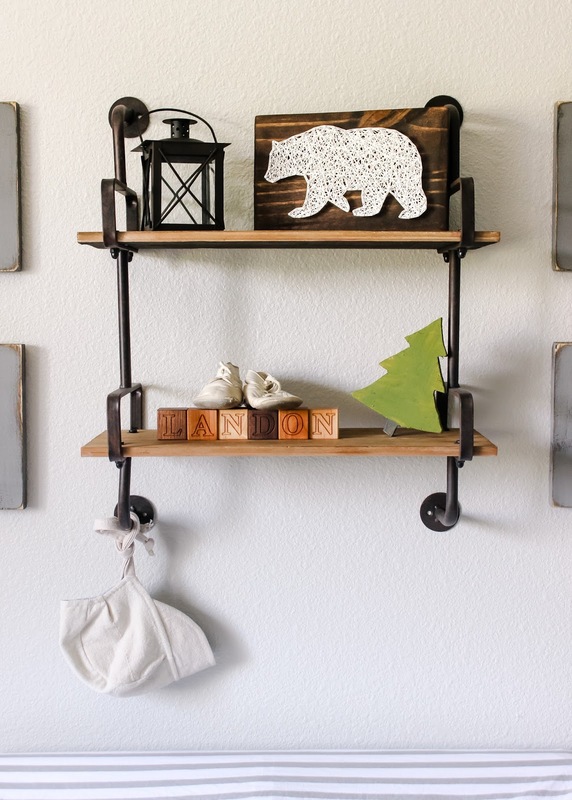 It has more of a woodsy, industrial, modern feel to it. 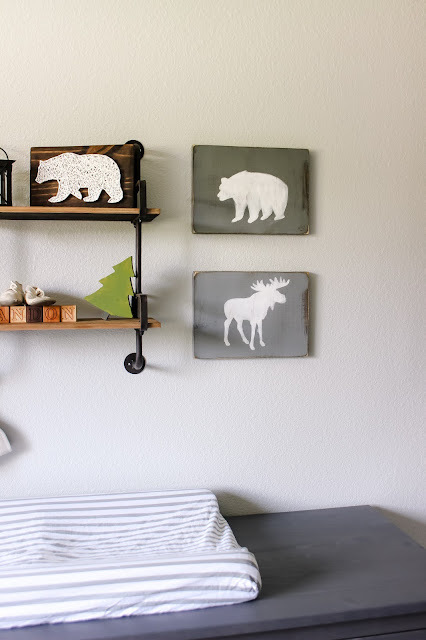 I'm loving the grey, white, and blacks right now which definitely came out when I started piecing his room together. Fortunately his room came together pretty easily! 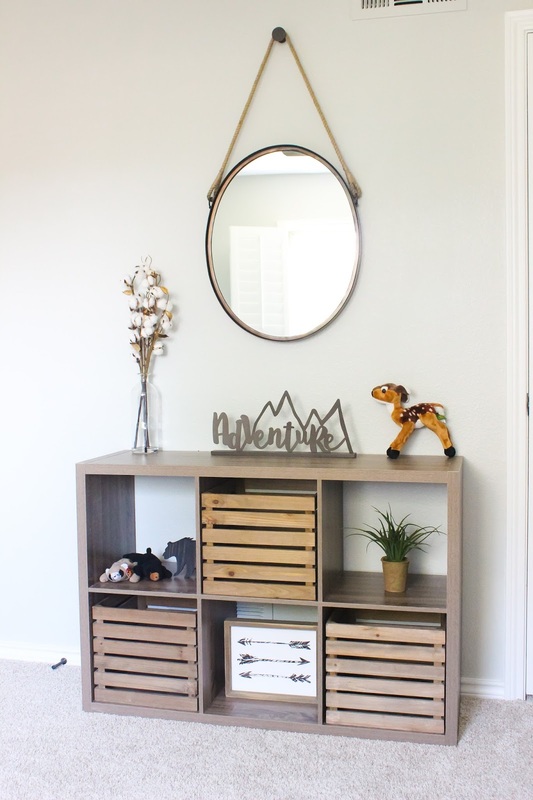 Everything I envisioned I easily found at either Target, Wayfair, or Etsy. Once we transitioned Raegan out of her crib and into her big girl bed, we just moved it into Landon's room. Took her a few weeks to be "ok" that her crib was no longer "her" crib. Now we are good! She talks about how the baby is going to go in her old bed. You got it girlfriend! 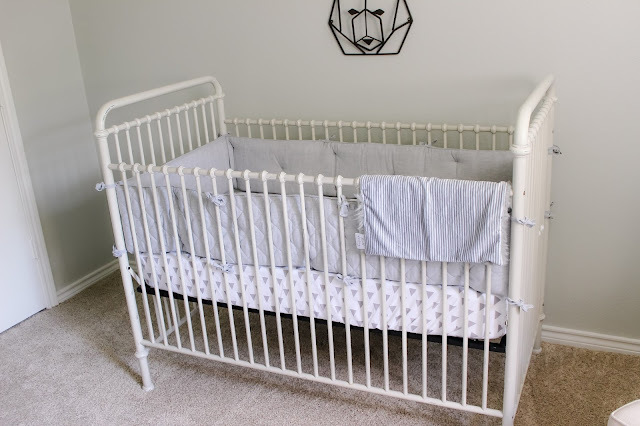 Pretty much the only way I convinced Kyle to let me buy this crib (it's from Restoration Hardware) when I was pregnant with Rae was saying that I'd use it with all my babies and fortunately it's totally gender neutral. We have it in brown for Hudson's room too. No way in heck was I was taking Raegan out of a crib at 19 months when he was born. No sir! 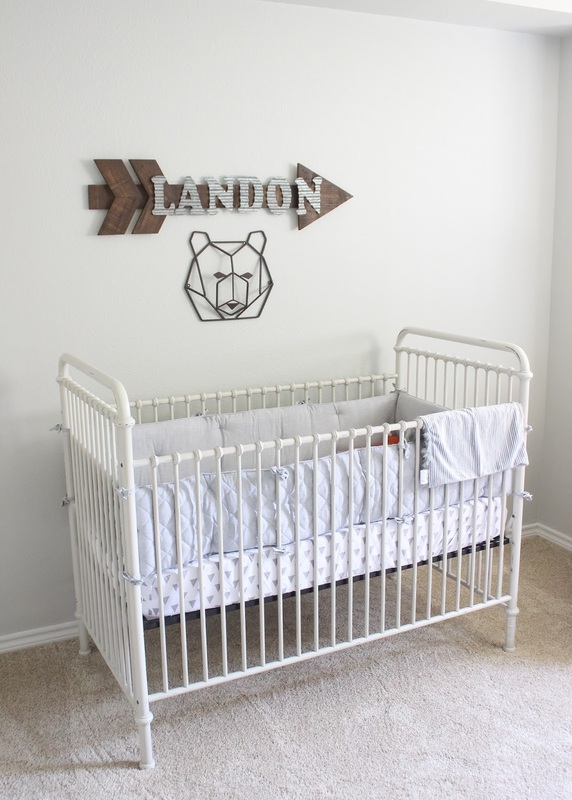 It wasn't until after I had Hudson that I found pretty much the exact crib on Wayfair for WAY less. So you're welcome. I linked the crib below. 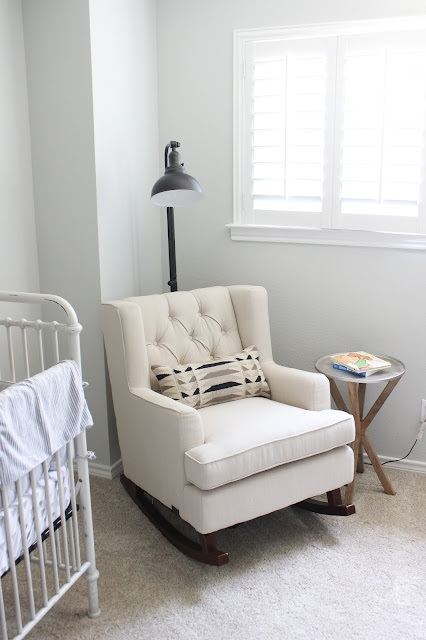 The chair that we had in Raegan's room we moved to Hudson's room when he was born. 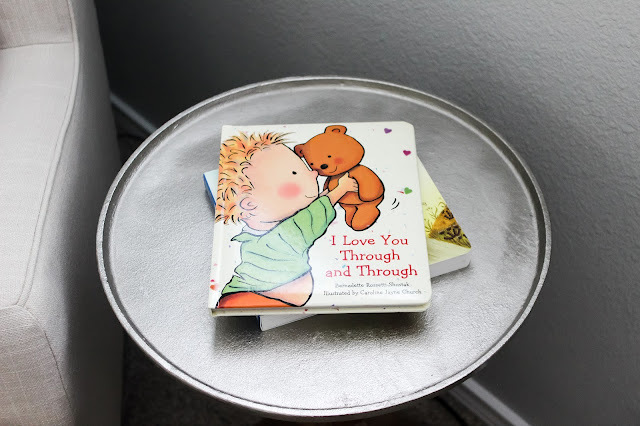 I really didn't miss having it in Raegan's room, but for some reason this time around, I still use it a lot in Hudson's room. So I knew I wanted to get another for Landon's room. I found this perfect rocker from Wayfair that I absolutely love! The best part is that once we are done using it in his room, it can be repurposed for somewhere else! The perfect neutral chair. The lamp also came from Wayfair and the side table is from Target. Right when you walk into the room to the left there was this blank space between the bedroom door and the closet. This little area wasn't really planned, but I knew I wanted something there. 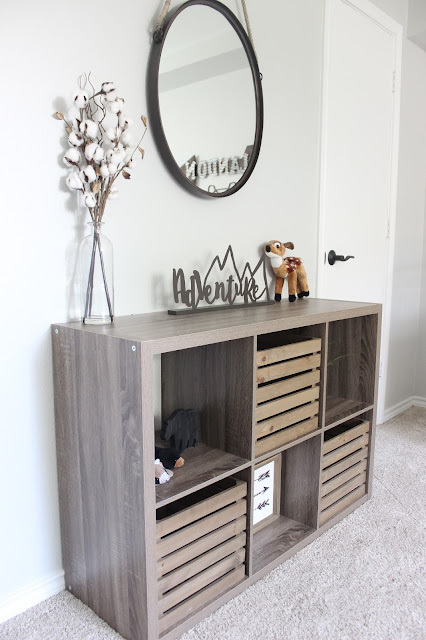 I found this adorable cubby bookshelf at Target as well as the crates. It'll be a great place to store toys and books later on when he's older. Picking out a dresser was easy. 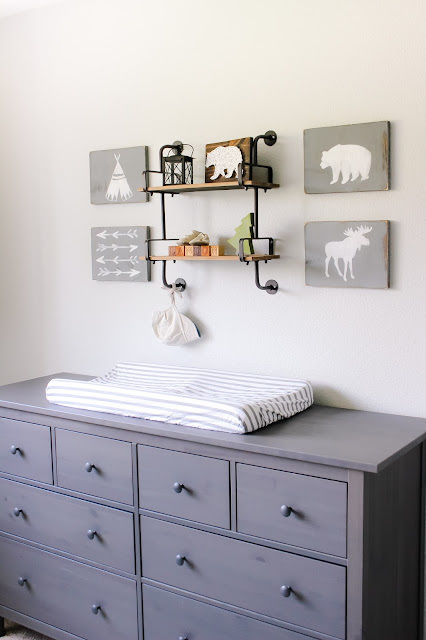 I loved the one we got for Hudson's nursery, so I got the exact same one in grey. Right now there's not much on top of the dresser, but we all know that'll change once he's here. I found this adorable bookshelf at Hobby Lobby and knew I had to make it work. It was too good to put back. 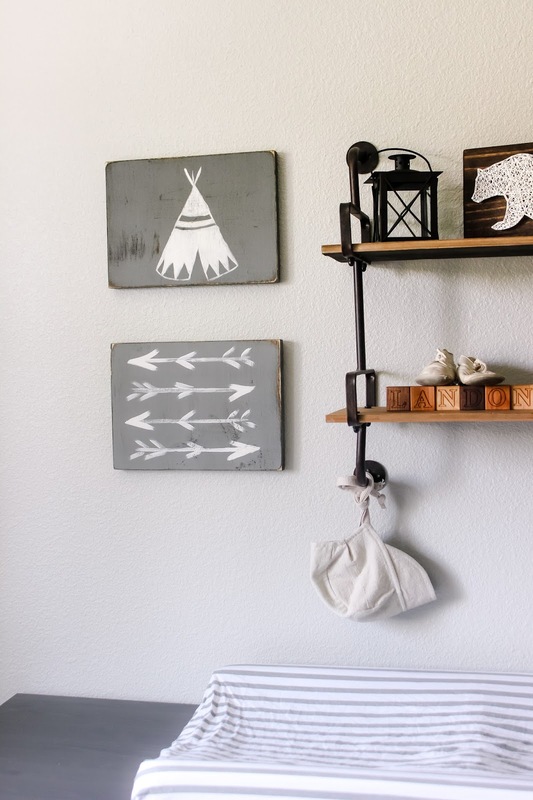 It's the perfect place for little knick knacks. The little shoes on top of his name are my dad's. 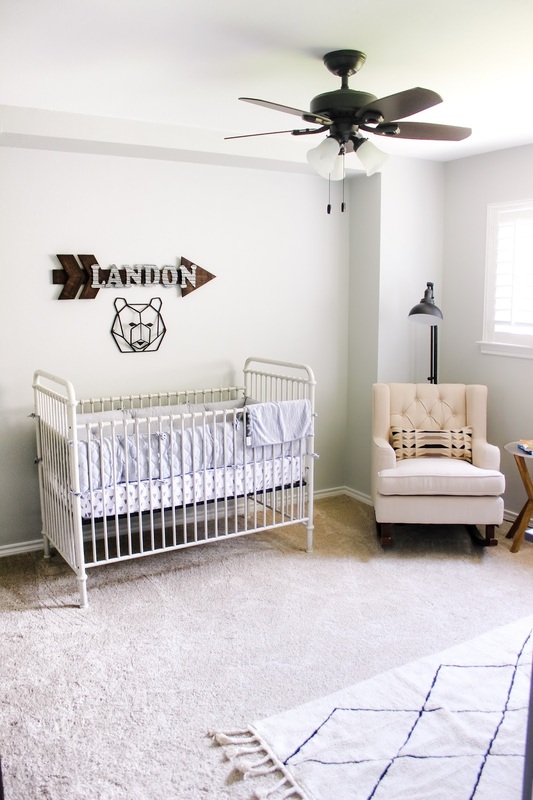 The perfect addition to his nursery since Landon's middle name is my dad's name, Patrick. And these adorable handmade signs were the perfect rustic addition to my vision for his nursery. Can't wait to bring home our sweet boy in the next 6 weeks. It's perfect! 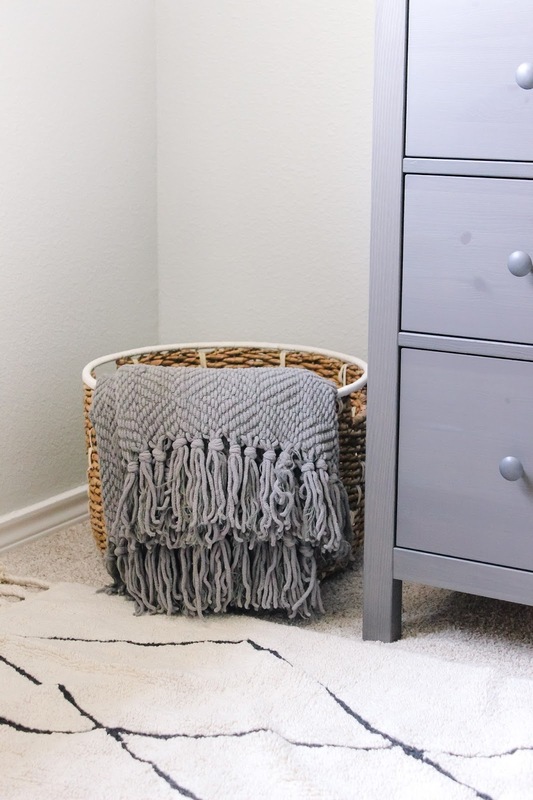 Such a bright, cheerful, sweet space for your newest little. Way to go! It looks so great! Can't wait to see that precious babe in there!